This course will give you an introduction to fatigue. 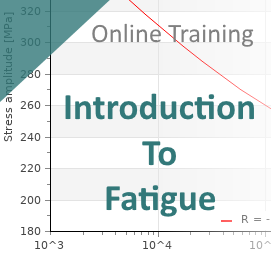 You will get to know the basics of fatigue, you will learn which factors play a role in the fatigue behaviour of structures, and you will learn how to design against fatigue. The course is a must for engineers working on cyclic loaded structures. But also engineering students interested in this topic will benefit from this course. After the last lesson you will have the opportunity to test your fatigue knowledge. If you pass the test you will get a certificate stating that you have completed the course succesfully. You will get access to the course for a period of 2 months. Each registration covers only one person. The lessons are given as presentations with a voice-over. So it is not a webinar. We have made a preview with 3 slides from 3 different lessons. The final test is part of the course and included in the price. After passing the final test a certificate will become available for download. The certificate states that you have succesfully completed this course.